In the 1930s, the Nazi party relied heavily on propaganda in order to spread its political and social views across Germany under the Third Reich. While this spread of ideas was most infamously carried out using military power, the government was also able to find its way into the homes and heads of the German people in a more subtle manner. The radio, a new invention in the twentieth century, quickly became popular in businesses and homes as a means of communication following the first news and entertainment broadcasts in 1920. The Nazi party capitalized on this popularity, developing the Volksempfänger, or “People’s Receiver,” line of radios in 1933 at the request of Propaganda Minister Joseph Goebbels. With its production subsidized by the government, the Volksempfänger VE 301 allowed the Third Reich to monopolize German airwaves unchecked. 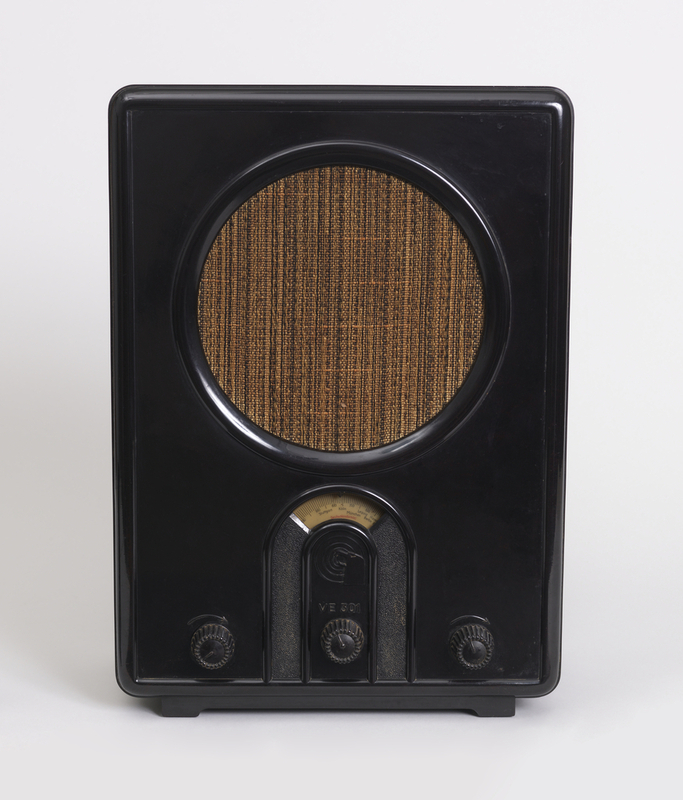 This small, unassuming radio was produced to commemorate Hitler’s appointment as chancellor of Germany on January 1, 1933, indicated by its model number, “VE 301,” printed on the front. As purpose-built propaganda devices, the Volksempfänger radios allowed their listeners to tune in to only the nearest local stations. This limitation served to further the radios’ ultimate aim, as stated in a 1936 propaganda poster: Ganz Deutschland hört den Führer mit dem Volksempfänger (“All of Germany hears the Führer with the People’s Receiver”). The Nazi party was not subtle in its indoctrination. The Propaganda Ministry’s slogan was Rundfunk in jedes Haus, or “Broadcasting in every home,” and this radio allowed it to become a reality. The cheap, standardized model was readily accessible to buyers, and roughly twelve and a half million units were sold by the start of World War II in 1939.